XENIA — Elisabeth Grooms of Xenia will celebrate her 90th birthday Tuesday, Dec. 4. She is a pickle-ball enthusiast, which is a big “Dill” for her and her teammates. Born in 1928 and raised in an orphanage in the Bronx, along with her seven siblings, she was able to put herself through nursing school. She would later join the US Army to continue her nursing career. Then she would meet her husband Benjamin as one of her patients. Liz worked in California and Cincinnati and also retired form the Greene County Health Department after 50 years of service. She and her late husband raised three children: Benjamin Jr. (deceased), Lynne and Michael Bradford and Tim and Tina Groom of Xenia. She has 10 grandchildren and 18 great-grandchildren. 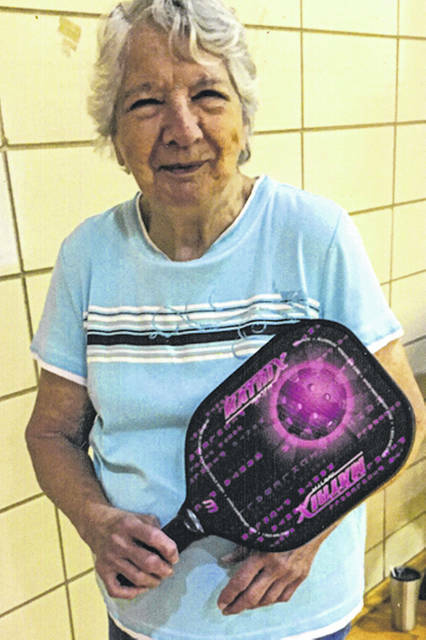 At age 90 the Xenia resident stays active walking, bowling, weight lifting and playing pickle-ball. She has been a faithful volunteer at the Greene County Democratic Headquarters. She will celebrate her 90 years with friends and family.